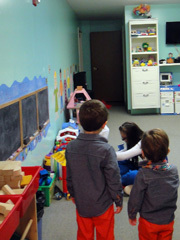 Nursery care is available during the 10:00 a.m. service. It is most appropriate for infants and children who are unable to sit through a church service. The children are brought into the church to receive communion. Children are welcome to remain with their parents in church and are not required to go to the nursery.